Richest people on earth: 2 Indians make in top 5 billionaires list ! Indian Billionaire’s have made pretty big strides in their net worth over last year. Forbes released their annual list of Billionaire’s and 2 Indians feature amongst the top 5 ! There are some notable changes at the top of the list as compared to last year. Bill Gates is no more the richest man in the world. Mexico’s Carlos Slim Helu beat Bill Gates and Warren Buffett for the top spot. It is for the first time in 2 decades that a person outside of USA has been crowned the richest man on Earth. His total Networth is pegged at 53.5 Billion dollars as compared to 53 Billion of Bill Gates. Third on the list is Warren Buffet with net worth of around 47 Billion Dollars. Mukesh Ambani chairman of Reliance Industries Ltd., is ranked fourth with $29 billion, up from $19.5 billion last year, when he was seventh. While another Indian Lakshmi Mittal, CEO of the world’s biggest steelmaker, ArcelorMittal, rose to fifth from eighth. Mittal’s net worth increased $9.4 billion to $28.7 billion ! Although, China may have passed India in its number of billionaires, but India still has bragging rights as home of the region’s richest. Ten of Asia’s top 25 are Indian. Hong Kong and Japan each have five. Mainland China has just one. B-School Placement Salaries: Are we being told the real Truth? We feel great that in Forbes world ranking, top 5 billionaire list- two are from india. mukesh sir & mittal sir. Absolutely thrilled ! 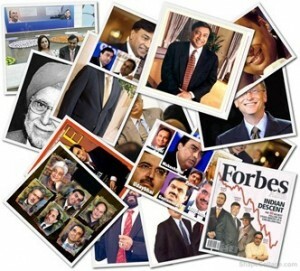 I wish ,one day to become in the Top 10 Indians featuring Billionaires Club . Bless me Lord ! Thank you.